Sainted Gregory (Nazianzus) the Theologian, Archbishop of Constantinople, an ecumenical father and teacher of the Church, was born into a Christian family of eminent lineage in the year 329, at Arianzos (not far from the city of Cappadocian Nazianzos). His father, likewise a Sainted Gregory, was Bishop of Nazianzos (Comm. 1 January); but of these two father and son, the son is the Saint Gregory Nazianzus encountered in Patristic theology. His mother, Saint Nonna (+ 374, Comm. 5 August), prayed God for a son, having given a vow to dedicate him to the Lord. As was revealed to her in a dream, she accordingly named her first-born Gregory. When the son learned to read, his mother presented him with the Holy Scripture. Saint Gregory received a quite complete and extensive education: after working at home with his uncle Saint Amphylokhios, an experienced teacher of rhetoric, he then studied in the schools of Nazianzos, Caesarea Cappadocia and Alexandria. Then for the finishing touches to his education, the saint set off to Athens. On the way from Alexandria to Hellas [Greek name for Greece] (352), during the time of a terrible storm of many days, he was apprehensive only that "the murderous waters would deprive him of the waters of cleansing". "For twenty days and nights, – relates Saint Gregory, – I lay at the ship's stern, beseeching the merciful God for salvation, and at this perilous time I gave a vow to dedicate myself to God, being saved through this vow". The saint spent six years at Athens, and there studied rhetorics, poetics, geometry and astronomy. His teachers were the reknown pagan rhetoricians Gymorias and Proeresias. Together with Saint Gregory, there also studied there Saint Basil, the future Archbishop of Caesarea Cappadocia (+ 379, Comm. 1 January). Their friendship, formed while still back in school in Caesarea, flourished in a deep spiritual closeness. But their acquaintance with Julian, the future emperor (361-363) – and apostate from the Christian faith, soon turned into implacable enmity. Upon the death of the Constantinople patriarch Valentus in the year 378, the Antioch Council invited Saint Gregory to help the Constantinople Church, which at this time moreso than at others was ravaged by heretics. 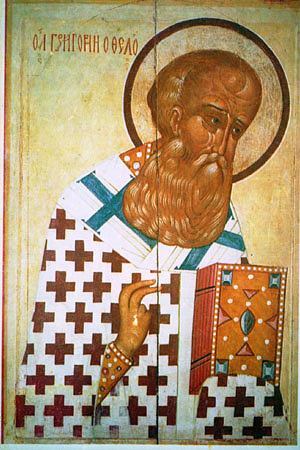 Having received the consent of Saint Basil the Great, Saint Gregory came to Constantinople upon the Patriarchal throne. In the year 379 he began to serve and preach in a not-large house church of his kinsmen. He named this church "Anastasis" ("Voskresenie" or "Resurrection"), believing that in this small church he would begin to resurrect Orthodoxy. Heretics ruled everywhere – whether they be Arians or Appolinarians. And the more loudly resounded his preaching, the more fully increased the gathering in church, and by this more bitterly grew the opposition of the heretics. On the night of Pascha 21 April 379, when Saint Gregory was making Baptism of the newly-illumined, a mob of armed heretics burst into the church and showered an hail of rocks upon the Orthodox, killing one bishop and wounding Saint Gregory. But the fortitude and mildness of the saint were his best armour, and his words regathered the Orthodox. The compiled works of Saint Gregory – discourses, letters, verses – all show, that he strove to be a worthy preacher of the truth of Christ. A gift of words was bestown him, and the saint sought to offer it in gift to God – the Word: ""This gift offer I up to my God, this gift I do dedicate to Him: – this alone, is what I have remaining as my riches; I gave up all else at the command of the Spirit; everything that I had, I gave in exchange for the pearl of great price. Only in words do I master it, as a servant of the Word; never intentionally would I wish to disdain this wealth, I esteem it, I set value by it, I am comforted by it more, than others are comforted by all the treasures of the world. It – is the companion of all my life, a good counselor and converser; a guide on the way to Heaven and a fervent co-ascetic". In order to worthily preach the Word of God, the saint assiduously prepared and revised his works. In five Sermons – "Discourses on Theology", dealing with those inclined towards the verbose reasonings of Eunomios, Saint Gregory first of all gives a precise definition, who it is from whom and when that they can theologise. Only those who are experienced can properly reason about God, those successful at contemplation and, foremost of all, pure in soul and body, or in utmost measure cleansed of self. To reason about God properly is possible only for one who enters into it with fervour and reverence. Explaining, that God has concealed His Essence from mankind, Saint Gregory demonstrates, that "by means of flesh it is impossible to view mental objects without admixture of the corporeal". To theologise talking about God in a positive sense is possible only when we become free from the external impressions of things and from their affects, when our guide – the mind, does not adhere to impure transitory images. Answering the Eunomians, who would presuppose by means of logical speculation to grasp at the Essence of God, the saint declared that man perceives God, when he is commensurate in form with the Divine Principle, i.e. when the mind co-unites with the commensurate Essence. Furthermore, the example of the Old Testament patriarchs and prophets and also the Apostles has demonstrated, that for earthly man the Essence of God is incomprehensible. Saint Gregory cited by way of example the futile sophistry of Eunomios: "God begat the Son either through His will, or contrary to will. If He begat contrary to will, then He underwent constraint. If by His will, then the Son is the Son of His intent". Closely examining everything that is said in the Gospel about the Third Person of the MostHoly Trinity, the saint refutes the heresy of Eunomios, which rejected the Divinity of the Holy Spirit. He comes to two fundamentally posited results. First, in reading Holy Scripture, it is necessary to reject blind literalism and to study so as to perceive its spiritual sense. Second, in the Old Testament the Holy Spirit operated hiddenly. In the New Testament "the Holy Spirit doth reside with us and in most evident form doth disclose Itself before us. As long as they did not acknowledge God the Father, they could not properly preach about the Son, and as long as they did not accept the Son, they could not, expressing it somewhat boldly, additionally burden us with the Holy Spirit. The Divinity of the Holy Spirit – is a sublime subject. Here before us is a mass of testimony. Christ is born – the Holy Spirit precedes this; Christ is baptised – the Spirit witnesses to this; Christ works miracles – the Spirit collaborates; Christ ascends – the Spirit comes in place of Him. And what indeed is great and Divine, that He is not capable of? What Name, appertaining to Divinity, does not apply to Him, except for UnBegotten and Begotten?...I am amazed, when I see such a richness of titles, – I tremble when I consider, which Name it is they do blaspheme, they who do so revolt against the Spirit!" The content of the Sermons of Saint Gregory does not consist in this alone. He wrote also: five laudatory tracts, ten interpretations of feastdays, two discourses of reproach against Julian the Apostate – "two pillars, on which is indelibly written the impiety of Julian for posterity", and preachings on other themes. In all, 45 sermons of Saint Gregory have been preserved. The letters of the saint compare with his best theological works. All of them are masterfully elaborated while yet brief, for the most part. In his hymns as in everything, Saint Gregory lived for Christ. "If the lengthy tracts of the heretics, – be indeed new psalters, at variance with David, and – the pretty verses they honour be as a third testament: then we also shalt sing psalms, and begin to write much and compose poetic metres", – said the saint. About his poetic gift the saint wrote thus: "I – am an organ of the Lord and sweetly by intricacy of song of the MostHigh I do glorify the King: all atremble before Him". The fame of the Orthodox preacher spread through East and West. But the saint lived in the very capital just as though he lived still in the wilderness – "his food was food of the wilderness; his clothing – whatever necessary; his making of rounds was without pretense, and being in proximity of the court – he sought nothing from the court". During a time of sickness the saint was given a shock. One whom he reckoned as his friend, the philosopher Maximos, was consecrated in place of Saint Gregory at Constantinople. Struck by the ingratitude of Maximos, the saint decided to resign the cathedra, but his faithful flock restrained him from it. The people threw the usurper out of the city. On 24 November 380 the holy emperor Theodosius arrived in the capital and, in enforcing his decree against the heretics, the chief church was returned to the Orthodox, with Saint Gregory solemnly making entrance. Soon an attempt on the life of Saint Gregory was in the offing, but the one who was to be the assassin instead appeared before the saint with tears of repentance. In the year 381 at the Second OEcumenical Council, Saint Gregory was confirmed in the dignity of Constantinople Patriarch. Upon the death of the Antioch Patriarch Meletios, Saint Gregory presided at the Council. Hoping to reconcile the West with the East, he offered to recognise Paulinos as Antioch Patriarch. But with the arrival of those who earlier had acted against Saint Gregory on the side of Maximos – particularly Egyptian and Macedonian bishops, they did not want to acknowledge the saint as Patriarch of Constantinople. Saint Gregory decided to sacrifice himself for the peace of the Church: "Let me be as the Prophet Jonah! I was guilty for the storm, but I would sacrifice myself for the salvation of the ship. Grab hold and throw me... I was not happy when I ascended the throne, and gladly would I descend it". Having explained to the emperor about his wish to quit the capital, Saint Gregory appeared again at the Council, in a farewell address asking it to let him depart in peace. Upon his return to his native region, Saint Gregory concerned himself about the incursion of Appolinarian heretics into the Nazianzos flock, and he established there as bishop the pious Eulalios, while he himself withdrew into the solitude of Arianzos so dear to his heart. Not forsaking the wilderness, the saint with zeal for the truth of Christ continued to affirm Orthodoxy through his letters and verses. In the year 389 he died, on 25 January, being honoured by the Church with the title "Theologian" bestown also on that beloved disciple of Christ – the holy Evangelist and Apostle John. "I want to speak boldly and forcefully, so that ye may be made the best, so that ye may turn from flesh to spirit, so that in right manner ye progress in spirit", – said Saint Gregory the Theologian.